Today I’m mixing in a few easy fall decorating ideas with the reveal of some new furniture we purchased for our living room. I know I have strung this out but honestly, it took me forever to get the final details in place. I literally bought one thing at a time, which took longer, but in the end it’s all exactly what I wanted. The changes are subtle because I stayed with the same colors…but it’s fresh and functions so much better than before. If you need to refresh your memory of what it looked like before, just click HERE. I replaced the sofa, two chairs and ottoman, the rug and the slipper chairs that flank the antique chest. (All sources are listed at the end.) I looked for a long time online and would have felt perfectly comfortable ordering that way…but I ended up buying from a furniture store called Art Van. They are a chain and have stores in the mid west, mostly in Ohio and Michigan. My husband suggested I go check it out because he knows the franchise owner. I was pleasantly surprised when I walked in and found exactly what I wanted. Nestle pine cones and cotton bolls in glass vases. Use a tray in a contrasting color. Add some large pine cones for interest and texture. The sofa: It helped that I was staying with neutral colors and I knew exactly what I wanted in a sofa. That narrowed down the choices considerably which made making a selection much easier. The fabric on the sofa is called Desire Pearl and is ivory with tiny flecks of beige. It has some texture and the piping is beautiful. I took your advice and chose a sofa with three seat cushions. The back is tight (which I love) and there is no skirt so the legs show. This is different from my last sofa so it’s a nice change. Use ribbon to attach a mini wreath to a lamp. Put fresh bittersweet in a small pitcher. Add an orange pumpkin for a pop of color. 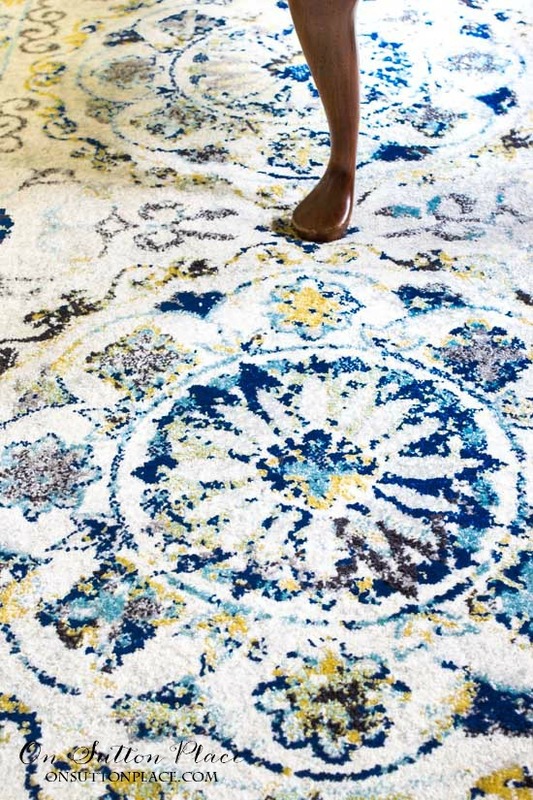 The rug: I picked out a rug that has all the colors found in my main downstairs rooms…navy blue, light blue, yellow and ivory. It was reasonably priced and when it was in place, I knew I had made the right choice. It ties in all the colors and lightens up the carpet. I still wish I had hardwood floors, but the new rug does help the old carpet look a little better. The chairs: The two chairs opposite the sofa are covered in a fabric called Ferrel Doe. 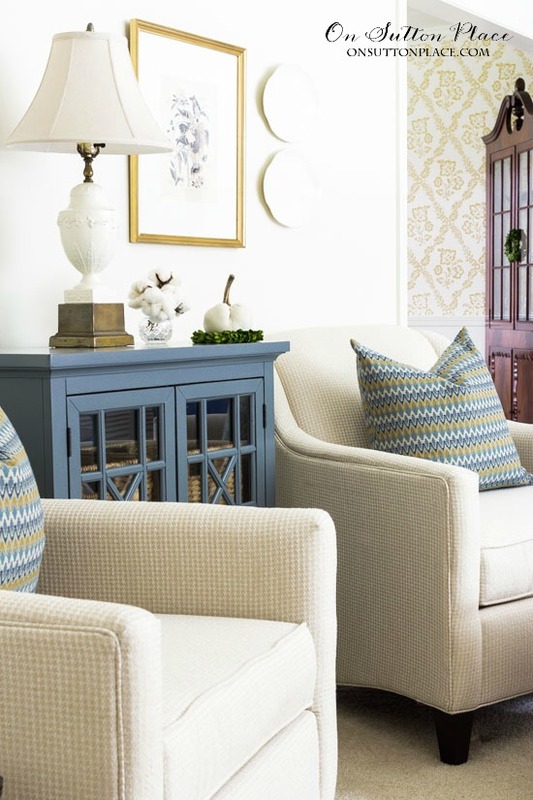 They are the same neutral as the sofa, but the fabric is a tone-on-tone woven houndstooth. I didn’t have to think twice once I saw this fabric. In fact, I found the fabric first and chose the chair style second. That might seem backwards but it was honestly easier because again, my choices were narrowed down quite a bit. Instead of one big ottoman, I opted for two smaller ones and it looks much better. 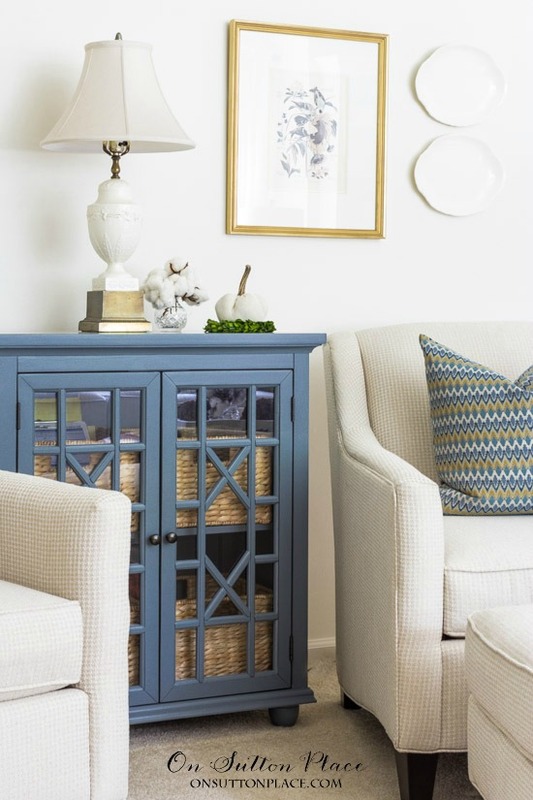 The storage cabinet: The blue cabinet was a choice made from necessity. In the picture above, the chair on the left is where I work…so I spend quite a bit of time in that corner. I sorely needed some storage so this seemed like the logical choice. It fits perfectly between the chairs and is the most wonderful cornflower blue so it pops right off the wall. I now have all my work stuff in one place which really does make my job much easier. Use faux or real white pumpkins in bowls or on shelves to add a subtle touch of fall to your decor. They can easily be found at your local garden center or grocery store. I found mine in the produce section of Kroger. The slipper chairs: I decided to get new slipper chairs after everything else was in place. The gold print on the old chairs seemed dated and I wanted a fresh, clean look. By the time I decided all this, my budget was almost tapped out so I had to do quite a bit of looking. I finally found these two little armless chairs on Overstock.com and they were definitely worth the time it took to find them. They are smaller and a bit lower than the other chairs, which gave that end of the room a more open feel. 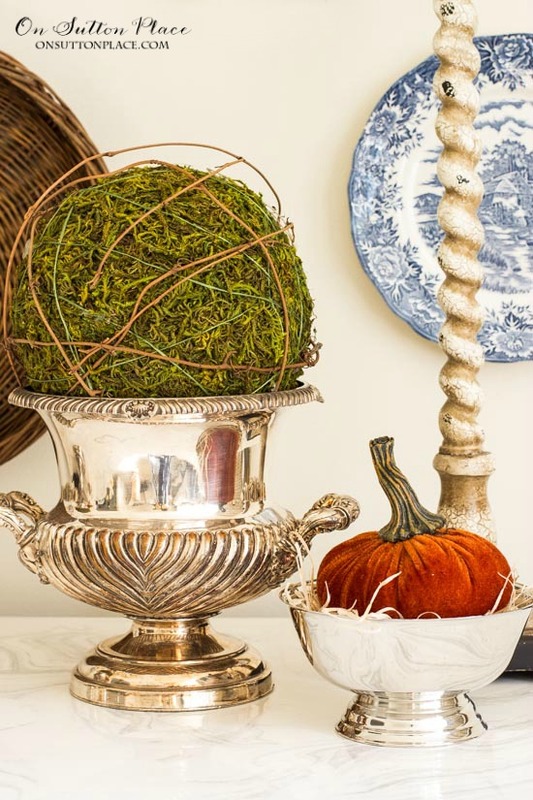 Fill vessels or bowls with raffia and top with a velvet pumpkin or moss ball. Use vintage silver, ironstone, baskets, crystal or small urns. *Some links on this page lead to shops and websites (like Amazon) where I am an affiliate. Click HERE for my complete Disclosure Statement. Pillows: Chevron pillows on chairs and gold pillows on sofa were lucky finds at TJMaxx. 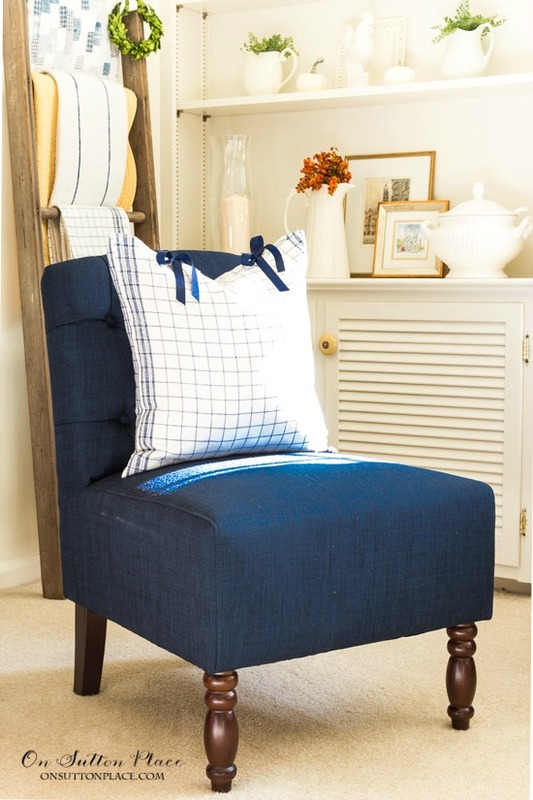 Pillow covers on navy chairs were made with vintage tea towels. This post has way more pictures than usual, so I’ll be back soon with close-ups of the vignettes and fall decor. I’ll keep a close eye on the comments for a few days so if you have a question, I will do my best to answer. I know sometimes I miss questions but it’s not on purpose…I hope you all know that! Love the recap…keep it up!! After looking at all you offered in October, the one thing I really loved (well, I love everything you do, Ann) I commented on before is so simple, elegant, small but very eyecatching. 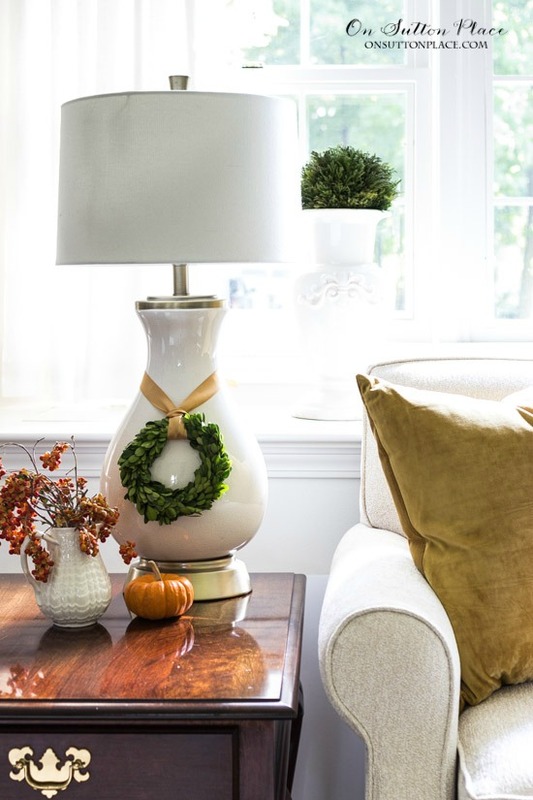 The wreath you attached to the lamp with a soft gold ribbon, accompanied by the little vase of and mini-pumpkin is adorable and proof that less can definitely be MORE! Love your style, Ann. But where do you get fresh bittersweet? Been looking, but have not been successful so far. So pretty, Ann! You do such a nice job of making a room look cohesive while showing restraint. (I find that to be challenging.). Your touches of fall were just right. I’m curious if you kept the yellow chairs for another room in your house. Even though you said they were dated, I liked them. I sold all the furniture on Craigslist. I haven’t had much success with Craigslist in the past but I’ve never tried to sell furniture before. I think people watch for certain things all the time and the IKEA stuff went right away. Thanks for your comment! I love the updates! Everything looks so fresh. Very pretty! Someday maybe new furniture here too. Your living room looks stunning. Great job ! The living room, just turned out beautifully, I love the slipper chairs, they add that bit of dimension at the end of room. Love it. 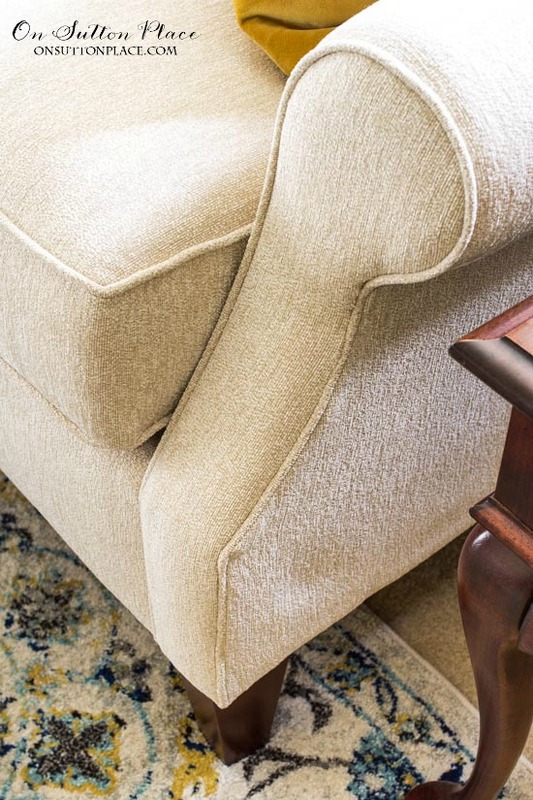 Do you think the slipper chair would work in a bedroom? I love the sofa! I tried to find it with your link but it went to sectional sofas and I couldn’t find any sofas in the Chloe collection. You did an awesome job with your chair choices too. Two thumbs up, Ann. I love all your new furnishings. Your room is lovely. I don’t think you can go wrong with classic colors. It is timeless. You did a fabulous job coordinating everything together. I am in love with the hounds tooth chairs! Congratulations on your new room. You deserve it! Ann, Your room is beautiful. Everyone that knows me knows that I am not a blue person….. more green, actually. But I love this. You inspire me to throw a little blue around. Ann, your room is beautiful! I love your style and the choices you made are spot on. Your talent for incorporating colors with neutrals is very evident. You did a great job with this room, not only furniture but accessories as well! Looks beautiful Ann! I love your new couch. I think it is a perfect choice. I also adore those pretty pillows on the chairs. It looks like you are ready for the season! It really looks marvelous,it always pays off to spend time looking for just the right pieces. It was worth the wait and besides you seem to have been very busy. Love your new living room, love the blue it’s so pretry.. Love the pops of fall also. Your living room looks great. I really like all your choices. I could move it all right into my house. Ha! I like to take a lot of time to make those choices too. Oh the mistakes I’ve made when I didn’t!! Enjoy your new room. I really appreciate you including the sources on your post. I click and buy little accessories often! Have you considered adding the Pin it button embedded in all of your pictures? Hi Linda! I used to have a pin it button on my images and removed it when it stopped working. I am looking for one that works on both desktop and mobile. Hopefully I’ll get that taken care of soon! I love what you’ve done with your living room. It’s lovely. I’ve started refreshing our living room too, & will follow your lead — one thing at a time until it’s exactly what I want. Thanks so much for sharing. You’ve done a great job. Thanks for posting the pictures of your new furnishings. Delightful journey through your living and dining rooms. I enjoyed the detail for each item in the room. 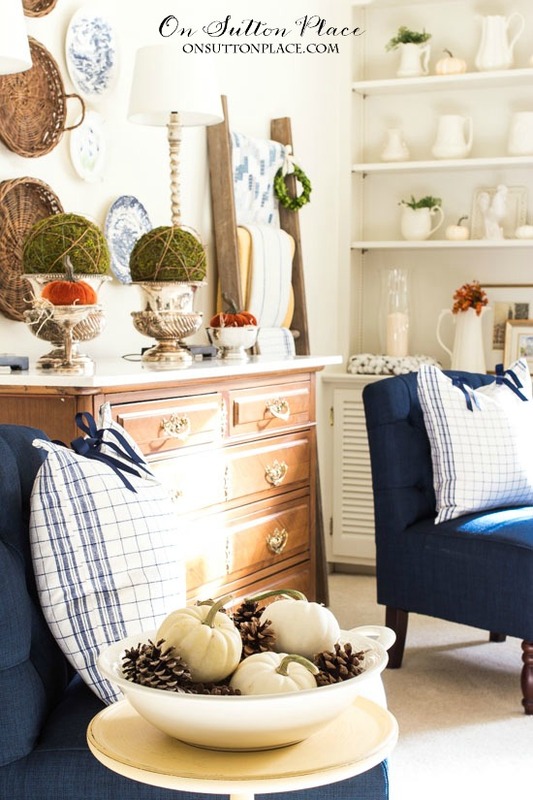 Your fall decor is such a great nod to fall without being overdone. Beautiful room. Fall is my favorite season, but will be watching to see what you do for Christmas. Thank you for such lovely ideas. Everything looks so pretty and yes, updated although I thought your room was very pretty before. Your eye floats effortlessly from one little vignette to another. Great job Ann! Stunning, Ann! The rug really is a statement piece and everything is reflected in your rug! It looks very fresh and uplifting! Thanks so much! I hope it makes you feel as lovely as it looks! It all looks lovely, Ann. And the rug and fabrics are perfect. So beautiful, Ann. Love the serene, clean, open, classic look of your new room….except that I’m not wanting to re-do my living room to match yours! :) Well done, my friend! Your living room turned out beautiful! Your color scheme of blue and yellow has to be one of my very favorites in blogland just because it is so unique. One of my reasons I enjoy your blog so much is that you share the detail. The fabric on your ne couch and chairs is just lovely. And I am in love with the new pillows on the slipper chairs. Your room is perfectly stunning! I think the darker wood pieces help to ground the room and they compliment the darker legs on the upholstered pieces. Everything looks great and I am glad you bought a sofa that could be tried on before purchasing. I love your colors, your home always looks lovely and pulled together so neatly. You are a smart and talented blogger! I truly enjoy your blog and learn so much from you. Oh and I want that cornflower blue cabinet! It’s gorgeous! Everything is beautiful and I love your fabric choices! Your patience in purchasing one item at a time has definitely paid off and you must be so happy with the end result! Have a wonderful day and enjoy your lovely room! I have just ordered a new couch, purchased two navy velvet like smaller scale chairs and love what you have gone!! Thinking of ordering your rug to replace my darker one! Thank you for sharing your beautiful new living room! Love the sofa and chairs. Too bad ArtVan isn’t out west. The blue chairs are cute but I do miss the yellow chairs. Your room is lovely and timeless. 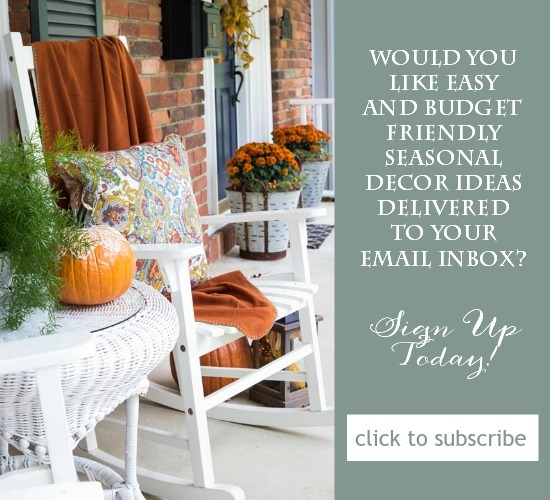 Every time I’d see your post in my email, I hoped it would be about your new living room makeover! Well today is the day, your new living room is gorgeous, Ann! I love every inch of it! The neutral colors are perfect. 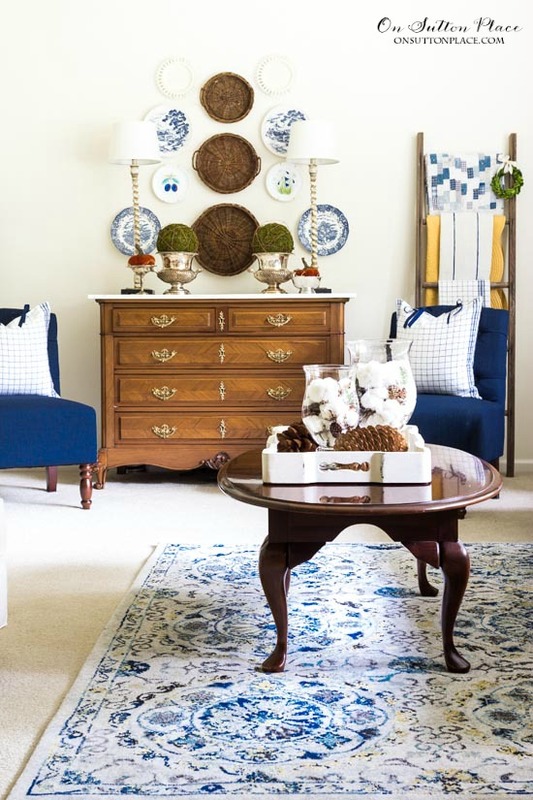 The blue chairs and the rug you’ve chosen as accent colors just pull everything together nicely. And on top of it all, You worked in some fall decorating. I hope you enjoy your new room for many years to come. And by the way, I think that cornflower blue cabinet is calling my name! I think I have to purchase it, if that’s ok with you? Absolutely! It arrived carefully packaged. It took some patience to remove all the shrink wrap. The only thing I had to do was screw on the little bun feet. I hope you like it as much as I do…enjoy! Great choices! Just enough change to make it all fresh, but still retain up or own personal style. You really have a talent for decorating. I always look forward to your posts. Was wondering what ever happened to the sofa search! It looks fantastic and those blue chairs really do pull the room together and give it balance and weight. I like them so much better in the room than the old chairs that were there. 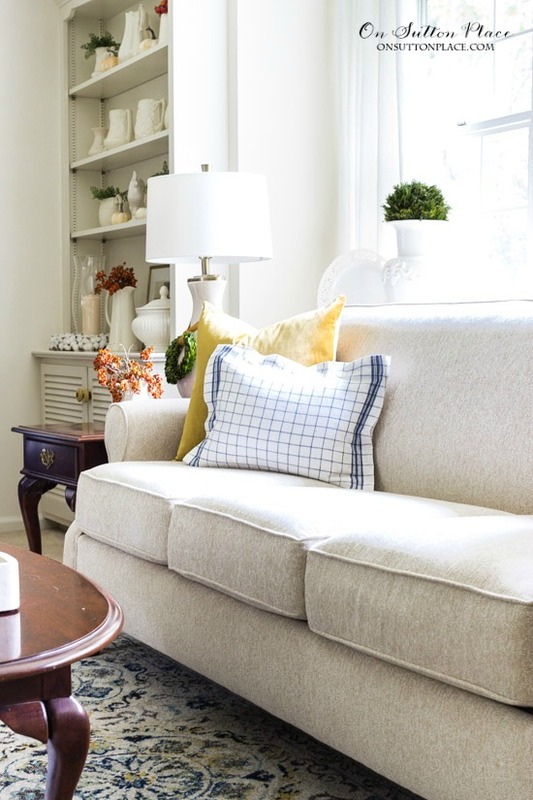 Love the couch and the houndstooth – my fave! Good morning Ann, more blue than gold and staying with the colors you love, so true:). I looked back at your old living room and the blue makes the living room brighter. I understand about old carpet and I need to buy a new rug too. I haven’t read the comments yet and I know Ann you have wonderful readers that love your blog like I do through the years:). Your Autumnal decor is what I would have in my living room. Your living room is lovely! What a beautiful and inviting space! I think it is best to take some time in making decorating decisions. The rug is beautiful and I prefer it to the ones you were considering for the space earlier. Thank you for all your easy decorating tips, I’m not in a position to update furniture now but I love your ideas, I will be looking for a little wreath to hang on one of my lamps! Looks beautiful Ann. I think you choices are perfect. Ann, it’s absolutely beautiful! I’m especially fond of your home as it always looks so warm and inviting. Everything is absolutely lovely. Totally classic, yet so liveable and inviting! Love the color scheme- blue and white are always so fresh looking to me. I know you will enjoy this room for years to come! Hi Annaliese! Oh how I would love to paint my tables…but my husband claims he would never forgive me. We bought them when we were first married and for some reason he’s attached to them. He rarely voices an opinion so when he does, I try to listen. I think I would have better luck getting him to replace them over painting them. Still working on that one! My husband is a woodworker and HATES painted wood. To him it is almost a sacrilege to paint over beautiful wood pieces. LOL. Excellent choices in shapes and styles – well done! Love the cabinet and the room has just come alive, hasn’t it! Bet you are really enjoying working from that corner now. Thanks for sharing this. Hi Anne! The dough bowl was a daily deal several years ago from Decor Steals. It was advertised as authentic but I can’t say 100% that it is. It looks like it. When it arrived, it was in a box the size of a coffin! I had planned to use it on my dining room table but it was so much bigger than I expected, so that idea was out. I leaned it on the wall and it’s been there ever since. Thank you for taking the time to comment…enjoy the day! Good Job! 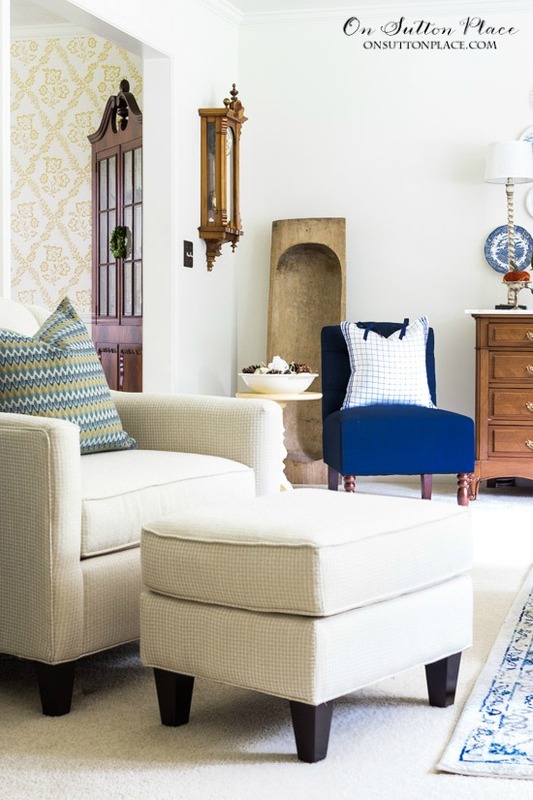 Love the rug too – it’s perfect and ties everything together so very well. Hi Ann…. the sofa and chairs are GEORGOUS! What a wonderful room to work out of, so beautiful and calm. I do have a question but not about the room, are you still selling your clay tags and fabrics?? I was just wondering. Have a great Sunday! Hi Edie! I don’t think I’ll be selling the clay tags any more. My friend who made them has decided not to continue. She is babysitting for her granddaughter so that is the priority right now. I hope to make the grain sack ornaments though. If I do, I’ll share them here on the blog. Thank you! Love the living room! It looks great! I also want to say that I always, always look forward to opening this email and finding all of your great ideas. I love blogs, but don’t get many in my email, but I kept yours. Just wanted you to know. Thank you! Thank you Sherry…this made me smile and totally made my day! Beautiful! I love the colors and textures. I know you are enjoying your new living area. How beautiful. I’m a huge fan of navy, white/cream and yellow. I love your choices and fall touches too! Ann, will you do an actual printable of your fall signature that includes Kelly in it? My schnauzer, Kizzie, would love to have a schnauzer in our fall decor. I love your printables! Please don’t think I have “over done” it, but in various rooms, I have a total of 6 displayed right now! Thanks. It is just gorgeous! I’m so glad you stayed with your colors since I love your home so much. My favorite sofa has a tight back and it is the best for naps. ???? I will miss your yellow chairs ???? but of course things have to be changed up from time to time. And hero doesn’t love velvet. We have a small vacation home near the U P in MI and there is an Art Van furniture store. The house came furnished from my mother in law and she bought her furniture there. I haven’t been there but your finds are perfect so maybe next year I’ll venture in. It’s beautiful Anne. Love the sofa and the chairs. But, the cabinet between your two chairs is the best. I love blue as well. Whenever I see something in blue my eye goes right to that space. Enjoy your new room, especially when you are sitting in there. Beautiful, Ann. Where did you source the moss grapevine ball? Keep up thr good work…lovely post. Love your style. Your living room looks fantastic. I know the ladder with throws hanging from it has been part of the room for sometime now but you’ve inspired me to bring my ladders inside to keep the throws handy as the emperature drops. Love the table top displays too. Looking forward to your posts in the coming weeks. I do have one question. How involved does your husband get in your decorating decisions? I recently remarried and my husband is a lot more involved than I’d like him to be. 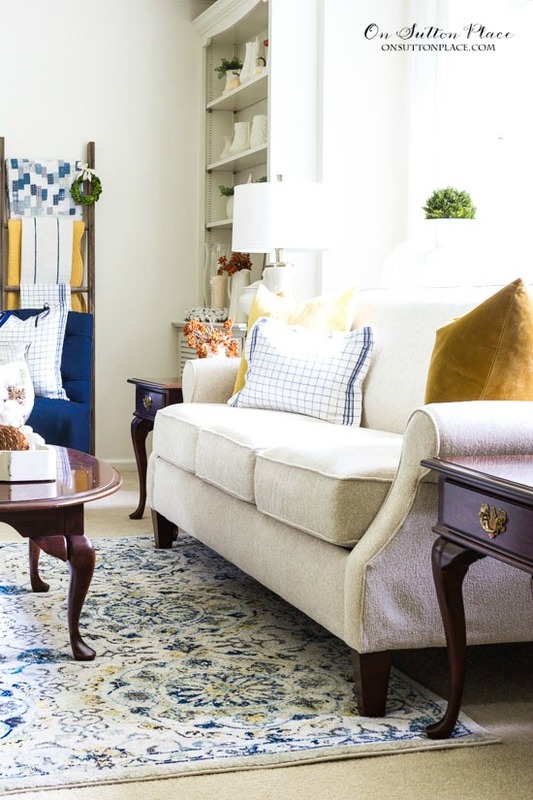 We recently got new flooring throughout the house and when it came time to pick an area rug for the living room, we looked at over 200 rugs – and he didn’t like ANY of them. I ended up with an area rug that is OK but certainly not my first choice. Most of my friend’s husbands could care less about decorating. How about yours? Hi Carole…my husband rarely has an opinion. He really doesn’t notice much either. Once in a great while he will voice an opinion so I try to listen when he does. The honest truth is that most of the time I don’t ask him…I just do what I want. I did find out when I was selling the gold print chairs that he never like them…which made me chuckle. I had them for four years and he never said a word. Go figure! You are one decorator that I truly get. Everything you did made sense to me. I’ve been updating to add more white and gold on no budget at all. Hubby doesn’t see the necessity. Lol. Challenges I love as I was raised in a very rural setting and learned to make something from nothing. At first glance I didn’t are for the blue print pillows and felt the blue was the wrong color for the scheme. But when I saw the picture with the Wedgwood cabinet I got it. I still wish there was a pop of royal in this area but it is lovely. This is just lovely. 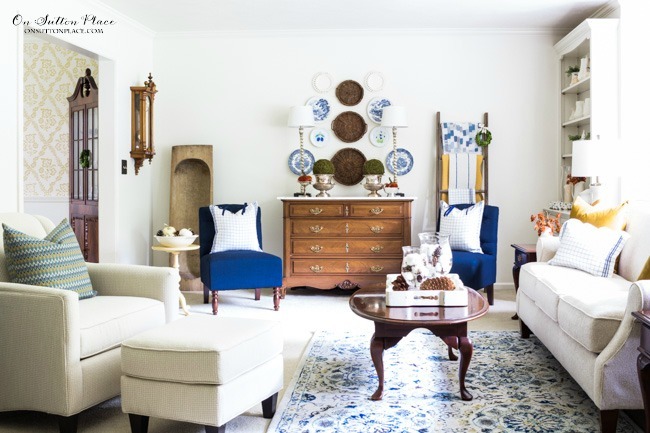 The slipper chairs and the blue cabinet are so pretty and the rug is swoon worthy. You must just walk into this room and stand there and look and enjoy everything. So happy for you and you made wonderful choices. I love this room. It has a lightness to it that really elevates the mood. Ann, your living room is lovely. The furniture pieces chosen work well for design, comfort, and beauty. Ann, I Iove your new look! I especially like the Ferrel Doe fabric choice on your chairs – what great texture! I usually spend a lot of time making purchase decisions and my husband usually has input, which sometimes makes it harder to find something, but I remind myself that it is his home too. I applaud you for taking his feeling into consideration.